The biggest drawback with the game is that it has only limited use -- it's great for attracting crowds of people, especially people who don't normally like video games. But not everyone will want to have it in their collection, particularly given the price tag. The controls, as mentioned above, were fantastic -- but with a couple problems. While they reliably read the correct height, it sometimes took an instant before the sensors would read the maracas position. This is no problem on the easy or medium levels of difficulty, where you usually have a bit of time to get into position. 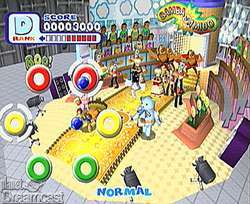 But it's murder at the most difficult settings -- making some of the challenges nearly impossible because you had to move the maracas faster than the Dreamcast could determine their position. Again, not something you care about when a group of friends are over goofing around, but frustrating when you're trying to blast through the game on your own. 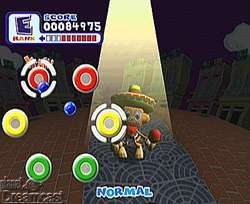 When playing two-player mode, you'll need a lot of floorspace -- if the players stand too close, their maracas will start to interfere with each other and send the wrong feedback. It also helps to have a nice big television. Oh no, your monkey is sad! Poor sad monkey! Samba De Amigo lacks a lot of levels. There are only four or five "sets" that the monkey dances on, one of which is simply a psychedelic swirl with random objects flying through space. Eventually you get tired of the same dancing buildings, but there aren't many locations to choose from. You can go online via Sega.net and grab more music for the game (technically, you just unlock hidden tracks on the CD). That's great except the hidden tracks are all music from old Sega games (like After Burner), so you won't find any more recognizable contemporary dance tunes. Nor can you put in your own CDs and get an automatically generated game level -- a feature that would always keep the game up to date and infinitely add to the replayability. Finally, the web browser's interface is terrible -- no interface should ever contain the message "Press Exit to Continue," but maybe that's just me. It's great to have a net component, but it's terribly under-utilized. Finally, it's important to consider the game's price. A set of Dreamcast maracas runs you $80, and the game itself costs another $40. That investment begins to make sense if you're planning on buying it for a high-traffic area -- buying a set for your whole college dorm room, or buying the whole shebang in anticipation of a big party where your entertainment budget has room for it. If you just want to hang out at home and play Dreamcast primarily single player, then the cost just doesn't make any sense. Samba De Amigo (with the maracas controllers) is one of the most original games out there. It's got a broad appeal, and it's perfect for getting groups of people together for a good time. A high price point and a lack of depth hurt the game, however -- unless you've got a lot of people handy, it's probably not worth the investment. It's a must-have if you bust your Dreamcast out at parties, but not a must-have for everyone's collection. Highs: Unlike anything else. Tons of fun with maracas controllers and a group of people to share the experience. Lows: Lacking in depth, very expensive. Other: 1-2 players, VMU compatible (5 blocks), Maraca Compatible (and strong recommended! ), VGA Box Compatible, Modem Compatible. For more Samba goodness, check out this week's PlanetFargo!